TV presenter and gardener Joe Swift will be calling in a The Apex on Sunday 2 October. Joe will dig deep to reveal his fascinating journey, from his rock n roll youth to becoming one of the country’s top Garden Designers. Discover what really happens behind the scenes at the RHS Chelsea Flower Show and Gardeners World and find out what it takes to get a Chelsea Show Gold Medal. Joe comes from a family of actors and writers; his dad is Clive Swift, who played the brow-beaten husband in BBC sitcom Keeping Up Appearances while his mother is acclaimed novelist Margaret Drabble. And his late uncle, David Swift, was best known as the badly-behaved news anchor Henry Davenport in Channel 4’s classic 90s satire, Drop The Dead Donkey. Joe’s TV credits include Gardeners World, RHS Flower shows at Chelsea, Hampton Court, Tatton Park and Malvern, Small Town Gardens and The Great Chelsea Garden Challenge amongst others. He writes a weekly column for the Times, monthly for Gardeners World magazine. He has appeared on Celebrity Masterchef and celebrity Bake Off, and although Paul Hollywood said his meringues were ‘superb’, he failed to get past round one! Joe performed in a rock band in the eighties and does still have the odd tinkle on his bass. Away from the cameras, Joe gets involved in community and school gardens, and is an ambassador for the National Gardens Scheme and patron of the Horniman Museum. Joe Swift will be at The Apex on Sunday 2 October at 7.30pm. Tickets are £16. 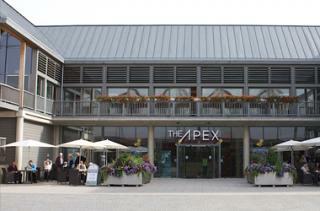 For more information, or to book, call the Box Office on 01284 758000, or visit www.theapex.co.uk.